Designer Mimi McMakin of Kemble Interiors says it was important to make the most of the courtyard outside the house because of the limited space inside, so it became a dining garden. 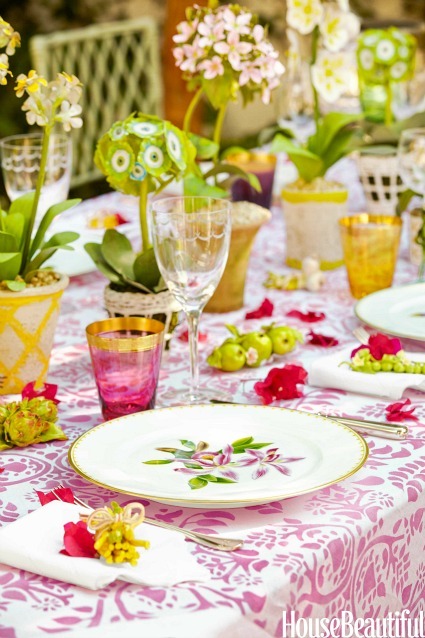 Here she sets a pink and green table for a “ladies luncheon” in Palm Beach. 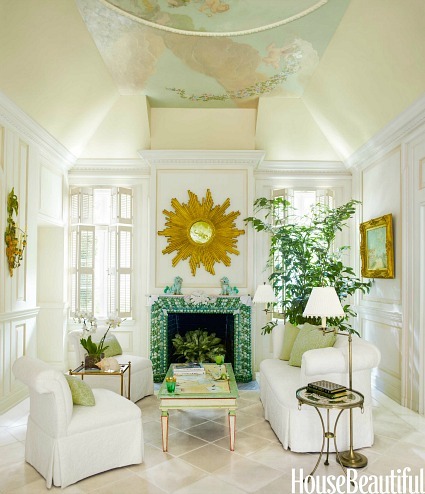 The garden theme extends inside with shades of green and white: “The owner wanted a feeling of being inside and outside at the same time.” Although the rooms are fairly small, the high ceilings with vintage wallpaper give them a bit of grandeur. 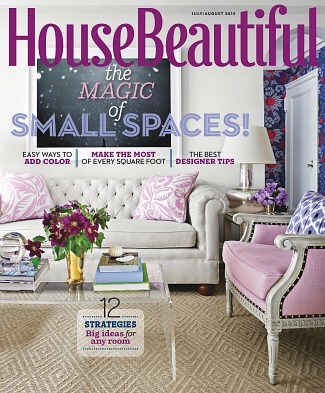 Pick up the new issue of House Beautiful for all of the photos and information about the maisonette. Story by Barbara King and photos by Eric Piasecki. Oh, bah humbug! I wanted to like this. I love the idea of a small house and a small garden. There’s nothing wrong with the house or the garden but, to my taste, the decorating is cold and uninviting. They missed such a great opportunity to add some cottage charm. I would tend to agree. At least as far as the living room goes. It is stunning, to be sure, but cozy is not a word I would use to describe it. Very highly stylized. The bedroom seems more cozy, but hard to tell from the one picture. The exterior and gardens are quite charming. Best, Beth C.
It’s almost fairy-tale like…very charming! Not my colors, but now I want to make those pink and greens part of my home! This home is absolutely beautiful! The design is amaze! For those with a craving for charming cottages flanked by colorful gardens and graced with cozy interiors, I highly recommend Mary Emmerling’s book, “American Country Cottages”. You can get it for a song on Amazon. And, unlike this designer’s oddly cold and off-putting style, Emmerling’s book does not disappoint. I love it and peruse it year-round. 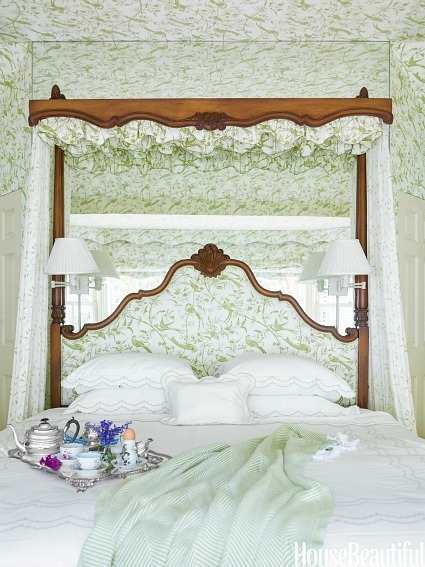 I love the garden and wallpapered ceiling, though I’m not crazy about the matchy-matchy bedroom. I think that can make a room feel much smaller and more confined. But still a gorgeous home! The interior is different and I can’t decide whether I like it or not. One thing I do love though, is the courtyard. I would spend a lot of time out there. I love white rooms so of course I love these two rooms shown. It’s very girl so not sure if she has a guy or what he thinks of the decorating. These pictures are a good example of why I don’t subscribe to House Beautiful anymore. They focus in on small details without letting you really see the rooms. They are very nice pictures but I would come away from an article feeling cheated. Do not understand why they would cover the window in the bedroom with such a big headboard. Does not make sense to me in such a small space. Leaves me flat. I love the outside of the house, but the inside screams do not touch. Beautiful, but it looks like it was decorated for a magazine. Do real people live in it, or mannequins? i do love the porch and the greenery 🙂 but the indoor spaces dont have much vibe. i do think small place need white as a basic color but splash of really warm colors make the place cheerful and take ur mind away from dimensions. I thought the whole house was lovely. I could never live full time with white but I truly love it. This is a place I could blissfully spend a week. It is a fantasy. Who doesn’t need a little of that? Hi Julia I love this home it’s quite charming. I guess because of the size you wouldn’t be able to go crazy with dark colours on the walls but they have made up for it with splashes of colour. The courtyard is beautiful. I don’t think i could improve on perfection. Thank you for sharing. Have a wonderful weekend. Regards Esther from Sydney. Inside but outside at the same time? I like that concept. You know that you are under a roof yet you feel like there’s no wall standing between you and the garden. Think you should criticize a design because it isn’t your taste or what you think a cottage should be. Think more about how it suits it’s location and underlying architectural style. These small rooms had high ceilings and elegant original tiled floors, that doesn’t lend itself to traditional”cottage style”. In fact the bedroom which many of you liked and I did as well actually does not suit the rest of the house because it is more of a traditional cottage style than the rest of the more elegant space . I come to this site to see a variety of styles, half of which I don’t like because they are not my personal style but I like to look at them anyway and decide if they are a successful design for their type of home. Doesn’t just the word ‘maisonette’ make a place sound so charming? This is lovely. One must consider context in decorating. This is a very elegant space, despite its size, in a very elegant location, in one of THE most elegant resort towns. Just look at the picture in the magazine of the dining room with its gorgeous arched French doors, elaborate moldings, and high ceilings. Cottagey or beachy would be all wrong. The design perfectly suits its environs which has its own local style. I could be very happy ensconced in that bedroom and then having a leisurely breakfast in the courtyard breathing in the fragrance of jasmine. I love the outdoor courtyard, garden and entry. I thought it was a window behind the headboard too as I’ve noticed that is how many people decorate. Maisonette is an elegant term for a small home too and it suits the place, especially the location. I echo Pamela’s sentiments. It’s not my style either, but so what. I like variety even if it isn’t my personal taste and I enjoy seeing other people’s designs and styles. It’s their home and all that matters is if they like it. Besides isn’t variety the spice of life–it would be so boring if we were all the same. I can usually find something about a place that I admire, like or even enjoy even if it doesn’t suit my personal style and if I don’t like it…well I’m not the one that lives there. 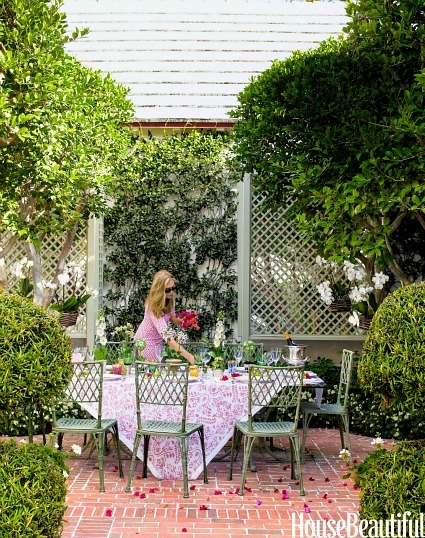 Ditto for Carolyn’s comment about having a leisurely breakfast in the courtyard and breathing in the fragrance of jasmine–that would be some kind of heaven. not totally my taste, but lovely. 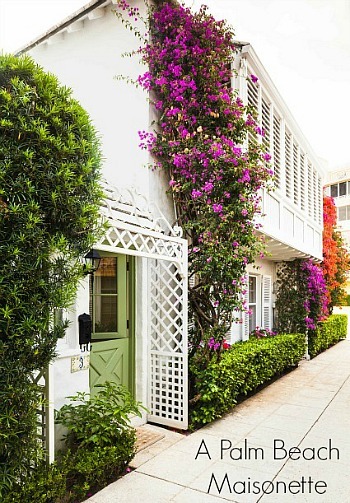 i think that might be palm beach cozy…. The décor wasn’t what I was expecting, but apropos for Palm Beach in my humble opinion. While the décor wasn’t what I’d normally gravitate to, I found myself rather intrigued. It’s nice to find something that stretches my taste a little.